Do you need help with an asylee green card? An immigration judge awarded you asylum, and you are now eligible to apply for lawful permanent residency? This guide for asylees applying for a green card is part of our series on green cards. If you need information or help about how to apply, you can keep on reading or contact us. Before applying for the green card, you should review your eligibility for that benefit. The United States Citizenship and Immigration Services (USCIS) will require that you show that you stayed in the United States for one year after USCIS or the immigration judge granted you asylum. You also need to show that you continue to meet the definition of someone who has received asylum. You do this by showing that you have not abandoned your asylee status, and you have not resettled in any other foreign country. An applicant asylee applying for a green card must also show that they are admissible to the United States. If you are not admissible to the United States, a waiver may fix this problem. Immigration laws state that before you can apply for lawful permanent residency as an asylee, you must have received asylee status. Applying for asylum in the United States is beyond the scope of this article and is covered in our guide to humanitarian relief. You may apply for lawful permanent residency and adjust your status in the United States after you have held asylum status for one year. The USCIS does not require you to apply for resident status, but you may if you wish. As an asylee, you have the right to live and work in the United States. You can work in the United States by filing an employment authorization form along with your form I-485. You can also travel abroad once you have resident status. Many asylees do apply for lawful permanent residency. Having lawful permanent resident status puts them on the path to citizenship. With citizenship the asylee the ability to sponsor other members of his family for immigration the United States. To apply for a green card for an asylee, you must submit an application for adjustment of status, which is form I-485, to the USCIS. Along with form I-485 you will submit form I765, employment authorization and form I-131, permission to travel abroad. Form I-131 and form I-765 will allow you to work and travel outside the United States before you receive resident status. The green card application form for an asylee is the same one as anybody uses to apply for adjustment of status. What is different is the evidence that you must submit as an asylee applying for a green card. Your application consists of the green card application form for asylee, form I-485, passport style photographs, form G-325A, form I-765, form I-131 and the medical exam form along with the vaccination supplement. You must also include evidence of your asylee status. The immigration officer or the Judge provided you with a letter saying that you had been granted asylum along with form I-94. When applying for adjustment of your status, you also need to add to your application a copy of your birth certificate, and proof that you have been living in the United States. At a minimum, you must include the fingerprint fee. You may be eligible for a fee waiver that some refugee or asylees are granted. Once your case is filed, you can check on its status on the USCIS website. 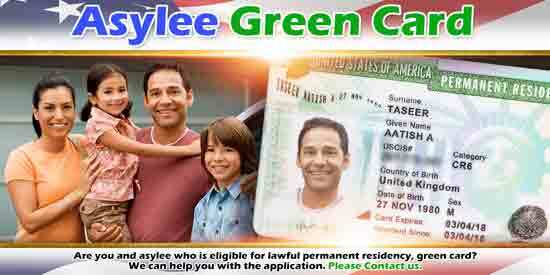 Everyone in the family must submit a separate application to receive the asylee green card. If you and your family were granted asylum at different times, make sure that everyone has at least one year in asylee status before applying to adjust status. If you apply for a green card based on asylum before the one year, the USCIS will deny your application. Asylee applicants for a green card don’t have to prov that they will not become a public charge. In a family-based green card application, the USCIS requires an affidavit of support. The United States relieved asylees from proving that they will be able to support themselves. One consideration in a green card application for an asylee is a question of admissibility. Perhaps the asylee knows that they are inadmissible due to committing a crime. Alternatively the asylee applicant may have violated immigration law in entering the United States. In either of these cases, the USCIS requires a waiver to these grounds of inadmissibility when you adjust status. Dealing with inadmissibility in preparing waivers is difficult. Consequently, we advise the asylee applying for green card to check with an immigration attorney. From this article about an asylee applying for a green card, you can see that we are familiar with asylee status. We are also very familiar with the green card process. We can help you through this process. Please contact us.